South Sudan: “After five days of fighting, this is the second day that it has been calm"
An interview with Ruben Pottier, the Médecins Sans Frontières field coordinator in Juba. "“After five days of fighting, this is the second day that it has been calm – there is no shooting that you can hear. The ceasefire has been respected in the sense that militarised groups are not fighting each other, but there is still a lot of shooting and looting going on. According to many of the patients we saw today, as well as our South Sudanese staff, one particular area of the city is still very insecure." They have had to flee their homes, and they are still too afraid to go back. Their houses have been looted and they have lost all their belongings. Some people who decided to go back home have found that everything was stolen, so they have had to come back to the compound of St Theresa’s church, in the south of Juba, where we are running our mobile clinic. People’s main humanitarian needs are for food, shelter, water and sanitation and basic healthcare. Yesterday did 150 consultations, today we did 377 consultations. We also screened children for malnutrition, and provided therapeutic food for those who were severely or acutely malnourished. Our patients are telling us terrible stories – how armed men came into their houses and shot the people inside. In escaping from the violence, many people lost family members. Today I met an eight-year-old boy whose mother and father were both shot and who now has no one to take care of him. I saw a girl of 12, her three-year-old sister in her arms, come for a consultation, saying she had lost both parents. My colleagues in the mobile clinic have seen at least three other children who came without any family, saying their mother and father had been shot. A lot of people were caught in the crossfire and have bullet wounds. Many others were injured while running in the chaos as they fled the fighting. Some grabbed wire fences while trying to climb over and have cuts to their fingers; others have wounds and bruises on their heads, arms and legs. 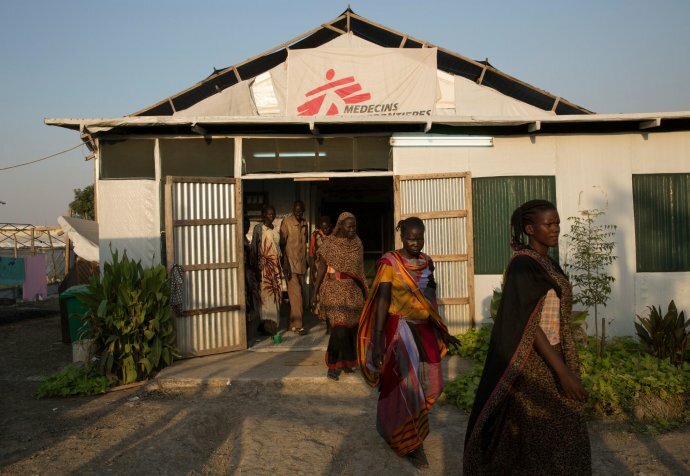 14 July, 2016 – Médecins Sans Frontières teams have begun responding to the medical needs in South Sudan following the recent upsurge in violence which broke out in Juba on Friday 8, putting the lives of thousands of people at risk, trapping them without access to food, water or medical care. Yesterday an Médecins Sans Frontières team of four ran mobile clinics at the St Theresa Church where 2,500 people were taking refuge. Médecins Sans Frontières teams are also providing mobile clinics in Gudele 1 and Gudele 2 today, where approximately 3,000 people are sheltering after having been displaced by intense fighting.